As I have had a bit of time on my hands I decided to try something a bit new. I purchased some Fimo clay and had a go at making some of my own beads. 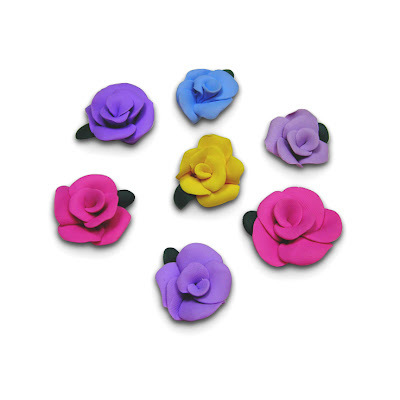 I love to use polymer clay flowers in my work so I decided to make some larger ones. They are not as easy to make as I thought they would be and I got very very frustrated! Here are some of the finished beads, I'm hoping to make them into something pretty soon! Thanks Laura!!! I may have a go tomorrow! I think that's great you're making your own rose beads. They turned out pretty great! I too would like to see how you incorporate them into your jewelry! If you ever need any help with making polymer clay beads, just ask.